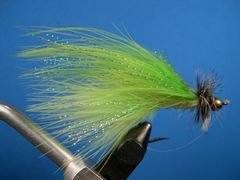 The Drop Nose Minnow is a pattern that was originally designed to take big western trout. 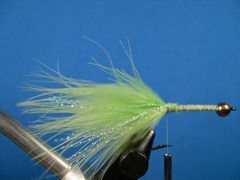 Since then, warmwater anglers have found it a good streamer, especially in Chartreuse, for smallmouth bass. This fly is about two and one-half inches long and it's a pretty straight forward tie. Tail, body, wing, and head in that order. 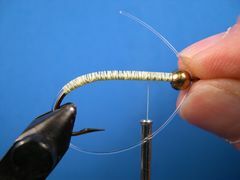 If you haven't made a crystal flash or peacock herl rope before, you will learn that neat procedure when you tie the Drop Nose Minnow. If you plan to fish the fly in weedy ponds and lakes you should incorporate a weedguard. A single loop mono weed guard will work, but tying it off is a bit tricky with a bead in the way. But, there is a way to solve that problem as you will see. This pattern can be tied in a variety of colors or color combinations. 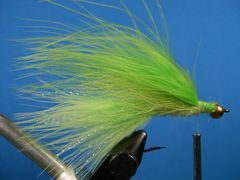 I also tie the Drop Nose Minnow with a chartreuse tail and a black wing. 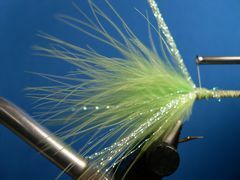 The bead helps drop the nose so the fly swims with a "jigging" motion when it's fished with a strip-pause retrieve. 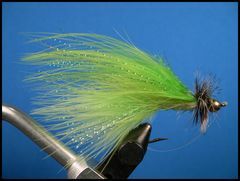 The fly is also effective when it's fished with steady short strips. Put a bead on the hook, clamp the hook in the vice, and crimp the barb. Attach the thread and lay down a base of thread to about one-third of the way down the bend if you are going to incorporate a weed guard. If you don't incorporate a weed guard, stop the thread at the hook bend. If you're incorporating a weed guard use 17# Mason Hard Mono and attach it to the hook by butting it up against the bead. Lash the guard material to the shank completely covering it and the existing thread base with thread. Size the weedguard by inserting the the tag end through the hook's eye, adjust it to size, and kink it. Flatten the kink with a needle nose pliers. Remove the excess leaving about 1/4" of mono beyond the kink. Select a Blood Marabou plume for the tail and tie it in. 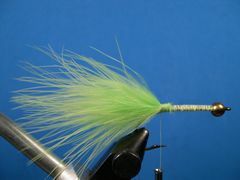 The Marabou tail should be about one and one-half times the length of the hook. 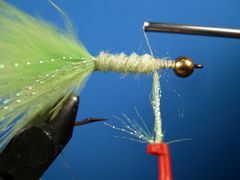 Tie in about a half of dozen strands of Crystal Flash or Rainbow Thread on each side of the tail. 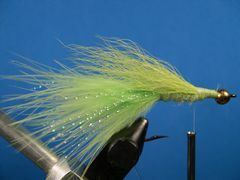 Select about a dozen strands of Chartreuse Crystal Flash, fold it and cut it into two bunches of equal length. Put the bunches together and tie the material in at the base of the tail. You will make this into a rope later. Dub a fairly full body with the Antron Dubbing. Stop about 1/4" from the bead. 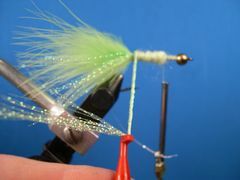 Attach your hackle pliers to the tips of the Crystal Flash that you attached in step 5. Twist it into a rope and rib the Antron body with it. Tie off the rib and remove the excess. Tie in a clump of calf tail for the underwing as shown in the photo. 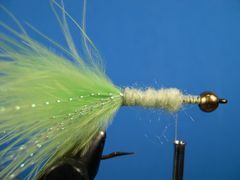 The calf tail helps keep the marabou wing from wrapping around the hook. 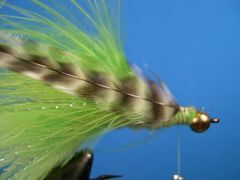 Select a Marabou plume and tie it in for the wing. It should be slightly longer than the tail in order to eliminate a "paint brush" effect. Tie in several strands of Peacock Crystal Flash for the topping. You could substitute a few peacock herls if you like. 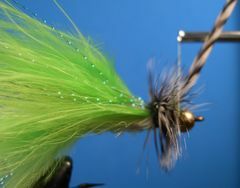 Select an appropriate Grizzly hackle and tie it in dry fly style. 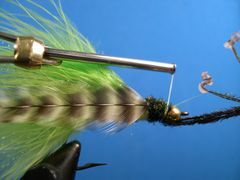 Tie in three peacock herls and make a rope by grasping them with your hackle pliers and twisting them as you spiral them toward the bead. Remove the excess herl. 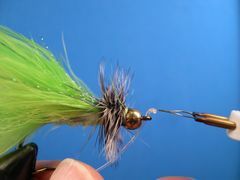 Wrap the Grizzly hackle to the bead and tie it off. Remove the excess feather. Make a couple of half-hitches or a whip finish and remove the thread. To tie off the weedguard insert the tag end through the hook's eye. Adjust the guard so that the kink is in the eye. Then melt the tip with a burning point as shown or use a lighter. Your goal is to melt the mono into a ball large enough to prevent the guard from slipping out of the hook's eye. 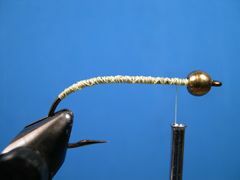 At the same time you want to maintain the proper distance between the guard material and the hook point. 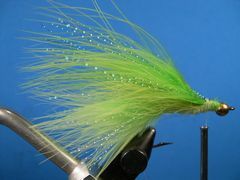 Your Drop Nose Minnow is finished.